(Bloomberg Opinion) -- From China, without love. The stampede of unicorns is losing fans. Xiaomi Corp. fell as much as 6 percent in its Monday debut in Hong Kong, while most of last year’s hottest listings, from ZhongAn Online P&C Insurance Co. to Ping An Healthcare & Technology Co., are trading below their IPO prices. Yet it seems nothing will stop the unicorns. In the two months since Xiaomi’s filing, more than 70 companies applied to list on the Hong Kong exchange, even as sentiment soured. The benchmark Hang Seng Index is now 13 percent below its January high, and Xiaomi had to cut its ambition almost by half, to a $48 billion valuation. So why do they keep coming? One reason could be a land-grab mentality in China. For example, after Canaan Inc., a maker of cyptocurrency-mining equipment, applied in Hong Kong, its larger rival Bitmain Technologies Ltd. said it would mull a listing too, even though Bitmain doesn’t need the money. You don’t want your competitor to hog the media spotlight. 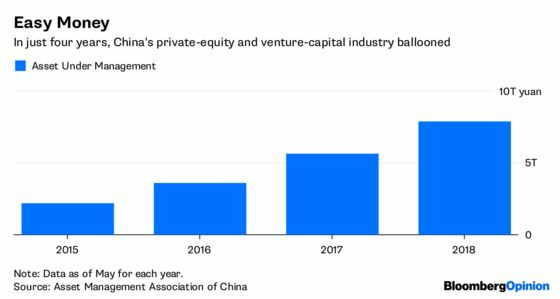 More likely, though, is that China’s 8 trillion yuan ($1.2 trillion) private-equity and venture-capital industry is starting to slow. 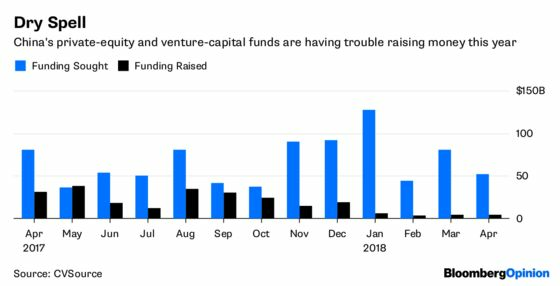 After a blockbuster 2017, these private funds raised just $4.4 billion in April, the latest month for which data are available, down 85 percent from a year earlier. This is because Beijing now sees reducing corporate debt as its economic priority, even allowing a few local government financing vehicles and quasi state-owned entities to default. Inevitably, tighter liquidity shows up in the VC world too. Afraid of a dry spell, unicorns may be rushing to IPO. 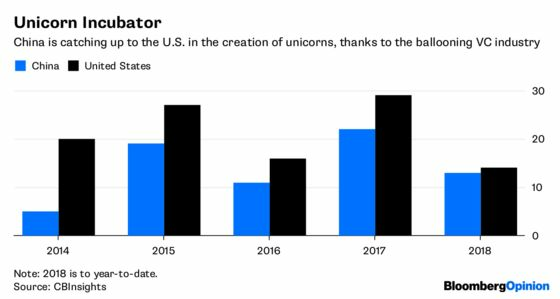 Before the People’s Bank of China tightened its purse strings this year, the nation was a stud farm for unicorns. Since the start of 2017, it produced 35 startups with a valuation of $1 billion or more. For many, though, too much of a good thing was just too much, as recent IPO filings show. Meituan Dianping, the world’s fourth most-valuable unicorn, managed to raise more than 48 billion yuan selling preferred shares between 2015 and 2017. But it was also handing out cash fast, incurring an almost 19 billion yuan operating loss in the meantime. Sales and marketing alone gobbled up 26 billion yuan, or half of revenue. The Hong Kong exchange, which until the end of April had stringent profitability requirements for new listings, will need time to figure out how to value such big losses. Or consider Uxin Ltd., which listed in New York last month. Between 2016 and the end of March 2018, the e-commerce provider for the used-auto market raised 4.7 billion yuan in new equity, while burning enough for a 3.5 billion-yuan operating loss. That was unusual even for U.S. investors accustomed to unprofitable technology firms. Of 70-odd Chinese ADRs, Uxin, Yingli Green Energy Holding Co. and the video-streaming site iQiyi Inc., which also went public this year, are the most unprofitable. Uxin’s shares are 18 percent below its IPO price. Seeing the VC world running dry, China’s unicorns are scrambling to find sugar daddies in the public markets. Buyer beware — a bit of discipline can be a good thing.